Trails are open. Ride with caution. All of our trails will be open at 5pm today. Ride with caution there is a lot of ice in spots. Everything has been groomed and in decent shape. The Argyle Ditch Bangers and the Blackhawk Riders still have some issues with the rain we had last week. Check their facebook pages for up dates. With the warm temps and rain coming in Saturday morning our trails will be closing at 6am, Saturday, 2/23. Hopefully we will be able to open back up Monday. Get out and ride today it may be the last chance of the year. Please be sure to bring your raffle tickets, both sold and unsold, to the meeting tomorrow night (Tuesday). There are only a few days left to sell them so we need to know how many are still available. Also, work on getting donations for the auction. See you tomorrow night at Rut-Roh's. We are opening the trails but there is alot of ice under the snow so ride with caution. The groomers are out trying to pack but it is not working the best with the ice under the snow. 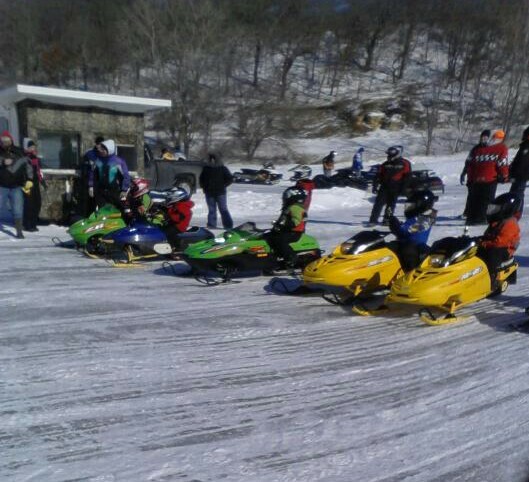 We are hoping the sleds will pack it down so please help us out and don't blow the snow off the trails.